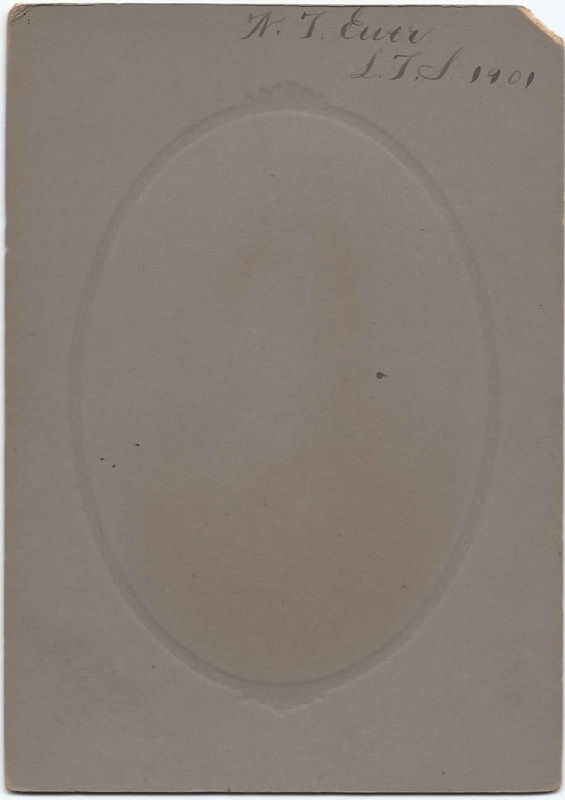 Photograph of a young man identified on the reverse as N. T. Ewer, who was Nathaniel Trull Ewer, taken by the studio of J. Powell of Lowell, Massachusetts. Notations in the lower left front indicate that this was a 1901 graduation photograph from L.T.S., or Lowell Textile School. See other posts that feature Lowell Textile School graduation photographs of Isaac Walwin Barr and Bartholomew Moore Parker. 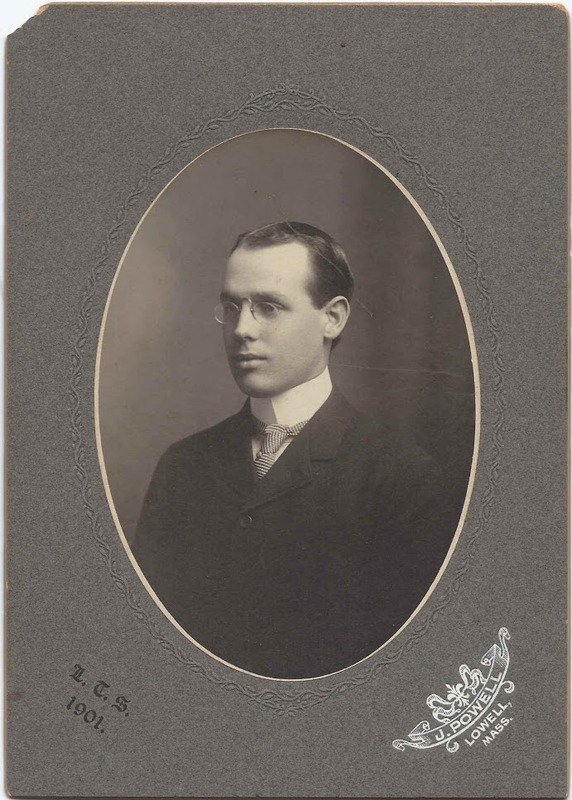 Nathaniel Trull Ewer was born 17 April 1877 at Reading, Massachusetts, the son of James Kendall Ewer and Emeline Holbrook (Trull) Ewer, who were born at Hyannis, Massachusetts, and Tewksbury, Massachusetts, respectively. On 23 November 1904 at Boston, Massachusetts, Nathaniel married Lilian Mabel Swint, daughter of John Wendall Swint, Jr., and Idellia Strong Richardson, or "Delia". By the time of the 1910 Census, Nathaniel and Mabel were living at Chester, Delaware, and had two children, son Kendall Swint Ewer and daughter Priscilla Swint Ewer. Nathaniel was working as chemist at a dye company. By 1920, the family was living at Springfield, Delaware, and there was another child in the family, son Nathaniel, Jr. Nathaniel, Sr., was still working as a chemist at a dye company. By 1930, the parents and two older children were living at Swarthmore, Pennsylvania. Nathaniel, Sr., was shown as working as a chemist. Nathaniel Jr., was also living at Swarthmore, and is described as a "Son", but he is listed on his own, on a different sheet. Nathaniel Trull Ewer, Sr., received a patent in 1924 for a foam stablilizer. While researching Nathaniel Trull, I came across several articles about a Nat Ewer and the Lucy Evelyn, the Harrington, Maine-built three-masted schooner that spent her final years as a gift shop at Beach Haven, New Jersey. Small world! I remember the late Norman Nelson of Machias, Maine, reminiscing about his experience sailing on the Lucy Evelyn in 1934, when he was 16. Many years later, while traveling down the Atlantic coast, Norman happened to pass through Beach Haven and was thunderstruck to see the Lucy Evelyn there. N.T. Ewer and family lived in Chester and Swarthmore, Pa not Delaware. To the best of my knowledge there was no son Philip, only brothers Kendall, Nat and sister Priscilla, whose middle name was Swint. She was my mother. N.T Ewer Sr died in 1934 in Pa. The Lucy Evelyn was indeed on Long Beach Island as a gift shop. I climbed around her rigging when she was floating in the bay prior to being landed. She burned in the later years, believe it was sometime in the 1980s or 90s. George Pratt 6/26/14. Thank you so much for providing these corrections and your personal reminiscence of the Lucy Evelyn. It was such a gift when I found that this photograph had a connection to Maine - the Lucy Evelyn - which I'd heard Norman Nelson speak about several times. Thanks for taking the time to comment! I am in possession of a letter found in a book acquired yesterday (Saturday, November 15, 2014). The book is a leather-bound copy of Adam Bede, by George Eliot (New York: Thomas Nelson and Sons, 1917), which has the bookplate of Beatrice Plummer Maccabe and also has her signature with the year 1919. The condition of the letter: browned; one fold; missing small pieces from the top and bottom corners on the left; two slight tears (each 4 mm.) into the right side (looking at the recto side while unfolded). The missing pieces are symmetrical, as are also the small tears, presumably because the damage was done while the letter was folded. I do not see a watermark in the paper. Centered at the top of the letter is the name and address of the letter's author printed in blue. The rest of the letter is handwritten using cursive script in dark ink on two sides of one sheet of paper. I have transcribed the letter below. The first handwritten word, "Tuesday," is in the upper right-hand corner (adjacent to the author's printed name) on the recto side of the sheet of paper. Each paragraph in the original letter is indented without a line break between paragraphs, but I have inserted line breaks in case the tabs I have used for indentation do not come through in one computer format or another. and I suppose Nat has forgotten it entirely. Turkey as we have about sixty in all. Born 17 April 1877 Reading, Mass. Children: Kendall Swint Ewer, Priscilla Swint Ewer, Nathaniel Ewer, Jr.
wedding," should be dated Tuesday, 23 November 1920, two days before Thanksgiving. What a treasure, Nathaniel, made so much more meaningful when placed in context! Thank you so much for adding the transcription - it makes the picture in the mind's eye so much richer! By the way, perhaps this is old hat to you, but I wonder if you might be interested in being a volunteer transcriber for the Smithsonian; you can do this at home. Many of the items to be transcribed are field notes that have to do with flora and fauna and are hard for the layman, but there are other things as well. I've helped on a diary, a memoir and, currently, a letter.